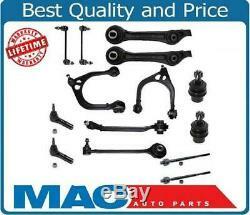 14 Piece Suspension Set Upper Lower Control Arms Inner Outer Tie Rod Ball Joint. REAR WHEEL DRIVE MODELS ONLY! This item is a brand new set of upper and lower control arms. It will fit the following makes and models. 1x Part# CH4782665AB K620177 Front Left Upper Control Arm With Bushings & Ball Joint. 1x Part# CH4782666AB K620178 Front Right Upper Control Arm With Bushings & Ball Joint. 1x Part# XCP CH4782613AC Front Left Lower Front Control Arm With Bushings & Ball Joint. 1x Part# XCP CH4782612AC Front Right Lower Front Control Arm With Bushings & Ball Joint. 2x Part# LII CH4782561AC Front Lower Rear Control Arm With Bushings. 1x Part# K80822 Front Passengers Side Stabilizer Link. 1x Part# K80823 Front Drivers Side Stabilizer Link. 2x Part# ES3571 Outer Tie Rods. 2x Part# EV80702 Inner Tie Rods. 2x Part# K80996 Lower Ball Joints. Merchandise MUST be in new condition. Part must be new, uninstalled, in original box. The item "14 Piece Suspension Set Upper Lower Control Arms Inner Outer Tie Rod Ball Joint" is in sale since Monday, June 23, 2014. This item is in the category "eBay Motors\Parts & Accessories\Car & Truck Parts\Suspension & Steering\Control Arms & Parts". The seller is "macautopartsdiscounts" and is located in Port Chester, New York. This item can be shipped to United States, Canada, United Kingdom, Denmark, Romania, Slovakia, Bulgaria, Czech republic, Finland, Hungary, Latvia, Lithuania, Malta, Estonia, Australia, Greece, Portugal, Cyprus, Slovenia, Japan, Sweden, South Korea, Indonesia, Taiwan, South africa, Thailand, Belgium, France, Hong Kong, Ireland, Netherlands, Poland, Spain, Italy, Germany, Austria, Bahamas, Mexico, New Zealand, Philippines, Singapore, Switzerland, Norway, Saudi arabia, Ukraine, United arab emirates, Qatar, Kuwait, Bahrain, Croatia, Malaysia, Brazil, Chile, Colombia, Costa rica, Dominican republic, Panama, Trinidad and tobago, Guatemala, El salvador, Honduras, Jamaica, Viet nam, China, Antigua and barbuda, Aruba, Belize, Dominica, Grenada, Saint kitts and nevis, Saint lucia, Montserrat, Turks and caicos islands, Barbados, Bermuda, Brunei darussalam, Bolivia, Ecuador, French guiana, Gibraltar, Guadeloupe, Iceland, Jordan, Cambodia, Cayman islands, Liechtenstein, Sri lanka, Luxembourg, Monaco, Macao, Martinique, Maldives, Nicaragua, Oman, Peru, Pakistan, Reunion, Uruguay.